The tour will focus on key architectural languages throughout Glasgow and discuss key buildings by architects including Gillespie Kidd + Coia, Mackintosh and Thomson while allowing participants space to practice various techniques in site reading and recordings. These recordings will take influence from Situationist and Letterist theory, contemporary art practice and sustainable practices such as material re-use and waste reduction. A city walk of 2-3 hours will start and finish at Civic House where a workshop will distill the days findings into an exhibition or show piece for discussion with groups from other workshops. This could be a large scale montage, video footage, experimental drawing or an output devised by the group itself. Tickets available via Eventbrite, here. 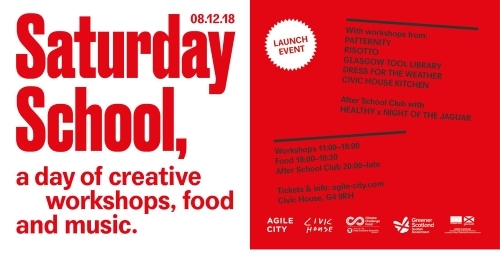 The event is part of Saturday School, a day of creative workshops to be held monthly at Civic House with workshops led by practitioners working across art, design and sustainability. The aim is to create a stimulating environment for testing new ideas, learning through making and sharing skills and knowledge. The very first edition in the new programme is on Saturday 8th December. Spend the day developing a new skill, exploring a practice or learning about new topics and subjects. Then from 6pm, share a meal with everyone who’s taken part in the workshops, served by the Civic House Kitchen team. From 9pm onwards, Civic House will host After School Club: The Final Night of the Jaguar!, an evening of performances and live music with HEALTHY x Night of the Jaguar. This event is free for workshop participants and open to the public.